Take a trip to the bright lights of Sin City in Vegas Party. Created by NetEnt, it’s a simple 5 reel, 243 ways to win video slot that might not offer much in the way of bonus features but delivers plenty of action thanks to the linked reels which appear on every spin. Play on all devices from between 25p and £125 per spin. 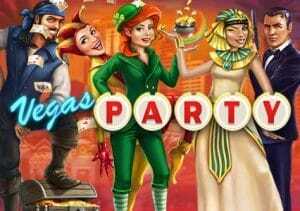 The design in Vegas Party is simply done – the bright lights of Vegas form the backdrop to the reels. There you’ll find lower value A to 9 symbols plus an assortment of characters commonly found in other games. They include a bearded, bandana-wearing pirate and a ginger Irishwoman. Land 5 of these on adjacent reels and you’ll pocket 10 times your bet. Next comes the ‘I can’t believe it’s not James Bond’ character who pays up to 16 times your bet followed by the winking Pharaoh queen who pays 20 times your bet for a 5-in-a-row combo. The best paying symbol is the LeoVegas poker chip – land 3, 4 or 5 of these on adjacent reels and you’ll win 2, 10 or 40 times your bet. A laughing female jester is the wild – she can appear on all 5 reels and substitute for all other symbols. It’s normally here that we write about all the bonus features on offer. In Vegas Party, you only have the Linked Reels feature. On each spin, at least 2 reels will join together to display matching symbols. These linked reels can spread though so that 3, 4 or even all 5 reels display matching symbols. The 2 adjacent symbols that start things off can land anywhere. So, for example, your linked reels could be reels 1 and 2, 2 and 3, 3 and 4 or 4 and 5. This is a very straightforward game but the linked reels can deliver plenty of action. Most of the time you’ll see just the 2 linked reels. Watch out when you get more than that though, especially if you manage to land combinations with higher value symbols. We’d put the variance in the medium range with maximum payouts of 1,080 times your bet available on every spin. There’s a light-hearted feel to the visuals and sound here which is in keeping with the party theme. The lack of bonus features will be a disappointment for some. Even without them, there’s still enough to make this a party you’ll want an invitation to. If you want better NetEnt video slots with bonus features and more extras, there are plenty to choose from – such as Planet of the Apes and Asgardian Stones.